Bianca, left, and MaKayla, right, eat Kids Cafe meals at the Rauner Family Y in Little Village. 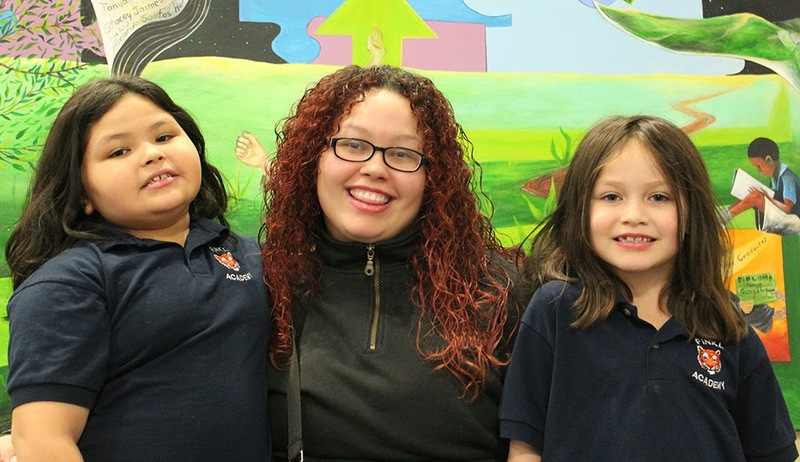 Mercedes Cruz looked on as her two daughters, 6-year-old MaKayla and 7-year-old Bianca, each happily peeled an orange at a Kids Cafe in the Little Village neighborhood. For the two children, it was just another day at the after school program. But Mercedes knew the importance of the oranges. “I can’t afford to send them to school with fresh fruit, so it’s great that they’re getting it here,” she said. MaKayla and Bianca have been enrolled in the program at the Rauner Family Y since September. The food they receive makes a significant impact. “It really helps with our budget,” Mercedes said. Mercedes works as a cashier at a local store. For the most part, she’s working 35-40 hours per week. But sometimes, when the store isn’t as busy, her hours decrease. A fluctuating paycheck makes it difficult to budget and afford food on a consistent basis. Mercedes’ boyfriend works the overnight shift at the grocery store. Despite both individuals having jobs, it can still be a struggle to make ends meet. For Bianca and MaKayla, the Kids Cafe means not being hungry after school, and having a place to get their homework done. Getting a variety of fresh fruit is a highlight, too. “I really like the bananas and grapes,” MaKayla said, in between orange slices. The children are part of a group of about 25 who receive meals every day at the program. To address the need, Maria hopes to expand enrollment in the future. But for now, the program remains a vital part of a healthy childhood for Bianca, MaKayla, and dozens of other children in our community.